The town of Arkham, Massachusetts, is in a panic. Horrific and bizarre events have begun to occur with increasing frequency - all seeming to point towards some cataclysmic event in the near future that may spell disaster for everyone. Only one small band of investigators can save Arkham from the Great Old Ones and destruction! Arkham Horror is a cooperative adventure board game based on H.P Lovecraft's Cthulhu Mythos. The game was originally published in 1987, and then republished in 2007. This new edition of the classic game has taken the game to new heights of popularity, and inspired a number of expansions. In Arkham Horror, players take on the role of investigators who take to the streets of Arkham in an attempt to save the town from an Ancient One, a powerful being that, if allowed to enter our world, may ultimately destroy it. Portals to other dimensions open around town, and investigators must avoid or fight the creatures that enter Arkham through these gates, enter the gates themselves, survive the alien places beyond, return to Arkham, and close the gates. If too many portals open, the Ancient One awakens, and the players only have one last chance to save the world – defeat the Ancient One in combat! In Arkham Horror, the end is near! The year is 1926, and the place is Arkham, Massachusetts. Gateways to places horrible beyond imagination are opening up all over town, releasing hideous creatures into the streets to stalk the night. Worse yet, if enough of these gates open up, then a creature of unfathomable power will be unleashed on the world! Pitted against these overwhelming odds is a small band of investigators determined to beat back the uncaring forces of the universe. They'll have to delve deep into the mysteries of the Mythos and use all of their skills, weapons, and spells if they want to have even a slim chance of success. The classic game of Lovecraftian adventure returns in a new edition after almost 20 years! Step into the lecture halls of the prestigious Miskatonic University! The world Arkham is larger and more terrifying than previously thought, but the members of this hallowed institution's faculty have seen true horror and stared into the face of madness. Heed their lessons well, for your ability to stand against ultimate cosmic evil and to survive with your mind intact is about to be put to the test! 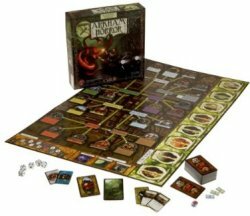 Miskatonic Horror is a new type of Arkham Horror expansion that builds upon the materials found in the ample library of other Arkham Horror expansions. The Miskatonic Horror expansion provides components to supplement every expansion of Arkham Horror! Prices shown are accurate as of Dec 23, 2017 17:54pm CST. Please follow the links for current pricing.